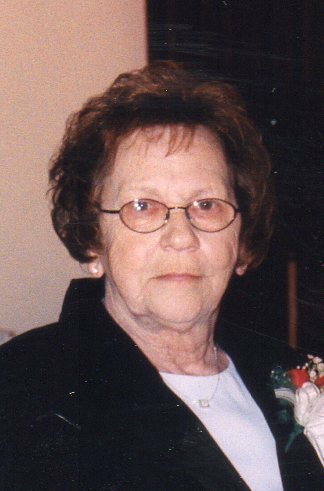 Jealea M. King, 80, of Sunrise Blvd, Fremont, OH passed away on Tuesday, January 22, 2013 at Stein Hospice in Sandusky, OH. She was born on October 3, 1932 in Bloomville, OH, the daughter of Clarence and Louvonda (Evans) Holt. Jealea married Vernon King, Jr. on October 29, 1949 in Greenup, KY and he survives. She was a Seamstress for Miley Draperies and Spieldenners. She then worked at Wal-Mart until she retired. Jealea attended Grace Community Church. She enjoyed sewing, cooking, dancing, crafts and traveling with her husband. She loved family gatherings. Jealea is survived by her husband, Vernon “Jr.” King, Jr., Fremont, OH; children, Wayne (Gladys) King, Deb (Leroy) Stratton, Terry (Karen) King, Cindy (Dale) Stout, Cheryl (Larry) Bruggeman, all of Fremont, OH; siblings, Martha Potts, Marion, OH, Donna Pirrung, Massillon, OH, Calvin Holt, Galion, OH, Firman Holt, Rossford, OH, Daryl Holt, Dwight, IL; grandchildren, Gary (Nika), Dave (Angela), Dorran, Jon, Anthony (Tiffany), Terra (Matt), Brandi (Johnny), Brandon, Brylee, Carrie (Ryan); twenty-two great grandchildren. She was preceded in death by her parents; siblings, Joe, Gerald, Don, Morris, George and Leroy Holt, Kay Hauser, Oma Holt; grandson, Douglas.